Articles in this issue discuss three important developments for economic policy. 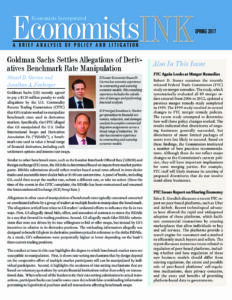 Goldman Sachs’s agreement to pay a $120 million penalty to settle allegations by the U.S. CFTC concerning manipulation of benchmark rates used in derivatives markets. The conduct at issue in this case highlights the degree to which benchmark market rates are susceptible to manipulation. A recent FTC report on peer-based platforms, such as Uber and Airbnb. The report illuminates a number of policy issues concerning these platforms. The recently released FTC study on merger remedies.The study’s findings led the FTC to institute a number of best practices recommendations that will have important implications for some merging parties.